A few days ago, I began thru hiking the Appalachian Trail. This means I intend to walk 2,192 miles from Springer Mountain GA to Mt Katahdin in Maine. My dad always took my family hiking and backpacking, mostly in the Smokies, and even so far as the Wind Rivers in Wyoming. I’ve hiked more than I’ve backpacked, but I learned to love, appreciate, and respect the outdoors at a very young age. On one of our trips in the Smokies, when I was about ten, we slept in a shelter on the AT and came across two girls who were “Thru Hiking.” This is when I learned what Thru Hiking was and when I decided I’d like to do it one day. In my eyes those girls were the coolest, and although I don’t know their names or faces, they set me on a path. Over the past decade, since college at UT, hiking in the Smoky Mountains has been my medicine. I work and hustle in Knoxville, then go to the mountains for respite. And every time I hike, I’d think about my future Thru Hike. My pack is at 26 lbs without water and a few other luxury items I’d really like to take. But my boyfriend Jacob is carrying the tent, stove, and fuel for the first few weeks, until he leaves me at Fontana Dam. But we are also packing 5 days worth of food, which is a lot. It’s hard to know where my weight will settle. I have less clothes than I imagined starting out with. So, no, I’m not an ultra-lighter, but I probably have a lot of things I’ll let go of during the first few stops. For now it feels good to have some emergency items on me, until I start to feel more comfortable. I feel like I’ve spent most of my money just getting the first few re-supplies. It has been a mighty endeavor just to leave. On my current feelings: I made the mistake of following the hashtag #at2019 on Instagram yesterday and seeing people who have made it to VA or mile 500. For some reason, that took the wind out of my sails a little bit. At this point, I realize I need to just focus on my journey, and take it one day at a time. It’s been bizarre, the range of emotions you go through in the months leading up to a trip like this, and there’s plenty of time for me to share that with you later. In a nutshell, though, it feels like a beautiful and committed relationship. It doesn’t matter the lows or highs. I’m in love and I’m all in. I’m giving my first talk about my home organization business next Tuesday at IJAMs Nature Center. It’s free, there are still spot available, and you can go here to learn how to register. I recently packed up all of my belongings to put into storage. I’m between houses right now, temporarily living at my parent’s cabin in Townsend. It’s been a goal of mine for a while to live here, and I’m so glad to finally be doing it. 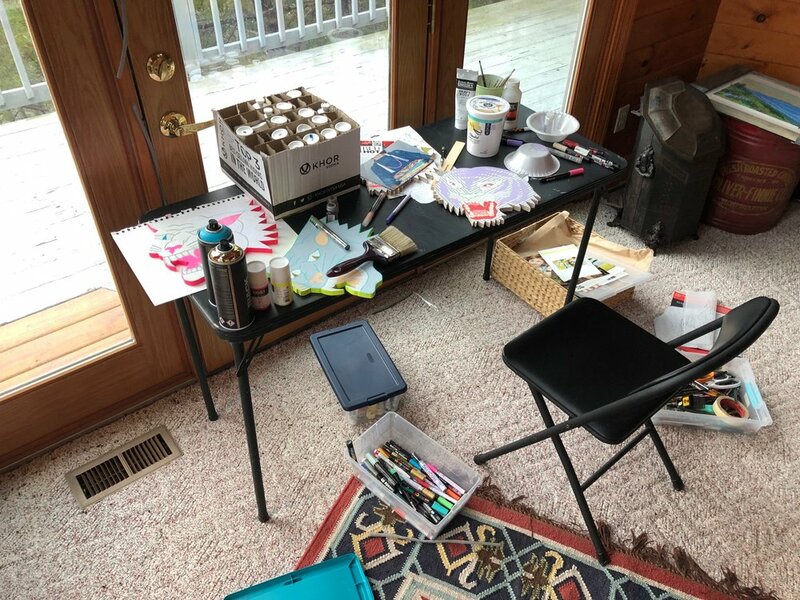 My studio was located in the house I just moved from, as well as a woodshop in the basement, so it was my first time to move my personal belongings along with all my art supplies and tools. The process was incredibly overwhelming. I’m going to talk more about this at my presentation, and you can learn a little bit about why I started an organization business here, but even though I personally started the organization process several years ago, I’m still very much in it. I have boxes from my childhood to go through, and items that I know I don’t want, but I know I don’t want to just hand over to a thrift store (an old computer, antiques I could sell, vintage jewelry that may be gold??). These boxes of “unprocessed” items are much fewer than they were before, but seeing them in storage on top of boxes of things I want to keep, on top of all my art supplies was a big dose of reality. I have a lot of “stuff” for one person! I’m grateful to have friends who could store my big furniture and boxes in their basements, and for my boyfriend who gladly took all my books. And for people who swooped in to buy artwork just so I wouldn’t have to store it. This phase in my life is temporary, but it’s a strange feeling for me to have so many things in storage because of my beliefs about this very subject, and it’s giving me time to think through it all. I don’t think you should ever force yourself to give up things you aren’t ready to give up. Our belongings have a lot of emotion tacked on to them and it can be a slow process to navigate through that. I have seen first hand that if I store sentimental things for a year, and I look at them again, I am often ready to let them go. This is a good feeling, to trust in time and distance. The biggest hope I have for my clients and myself is to quit living in limbo, or if we have to live in limbo, not to live there for long. For instance, don’t store things just to store them, but rather live within the means of the space you have. If you know you will have a bigger space within a year, I think it’s fine, but if it’s years, do your best to accept your present state of life by letting go of what can’t fit. I think this simple rule of thumb can change your perspective on life. The opposite of limbo is living in the present. When we live within our means financially and spatially, we allow our minds to rest and focus on the most important things in our lives, and these things are different from person to person. I know my set of circumstances is temporary. I plan to move in to a new place within a year, and there, all the things I put into boxes will go with me. While I’m not a huge advocate for minimalism either way, I do daydream about owning less, and, as a result, moving around in the world a little more easily. I hope this process, will help me put some things into perspective. When I open those boxes again, I want to be able to let go of many of the objects in them. I am pondering the vision I have for my life. What is yours? View from the deck in Townsend, looking at the Great Smoky Mountains. This past December, I made a decision about what my plans would be in 2019. I’m not ready to share them publicly yet. I’ve been anxious to, but there are hurdles that keep popping up, and I want to get through them before I make any grand announcement. But I would like to share with you the precursor to these plans. I’m on the road to something, and it’s exciting to have made it this far. At the end of January, I moved out of my house near downtown Knoxville, put my belongings in storage, and drove to my hometown Memphis. There I lived with my sister, worked with new clients, sweet friends and family who hired me for my home organization services ( The Empathetic Organizer), went to Disney World, for the first time!, with my sisters, and hung out with old friends. But now I’m back in East Tennessee, doing something that’s been in the back of my mind to do for many years now: I’m living at my parent’s cabin in Townsend, Tennessee, right next to the Smoky Mountains. Make-shift studio, with a view. As soon as I pulled in the driveway, it felt so good to be here. I realized my desire last year to live alone. On top of that, I’ve lived in condensed neighborhoods for the past decade. I’ve been so ready to be secluded, not devoid of friends or society, but to have my living space out of arm’s reach of the next dwelling. It’s also nice not to have punks speeding down my street, blaring their basses, etc etc, because I have become very set in my crotchety old lady ways. I’ve been ordered by my doctor not to walk for two weeks. It seems I may have a stress fracture, and to avoid the unnecessary cost of an MRI and a boot, I’m trying to do what it takes to heal up on its own. This is SUPER hard because my plans involve physical training. Ok, that’s the most I will say. I never know how much money I’ll owe once I file my income tax, and it could kill my dream. I hope to have everything my accountant needs for her to file in the next week or so, so hopefully I’ll know soon if I’m going to get crushed or not. In the meantime, I’m enjoying this time so far. I haven’t been lonely in the least. My dad and my parent’s dog Fern are here, my boyfriend has come up to visit, and I’ve all ready gone into Knoxville a couple of times for First Friday, to see friends, and to run errands. I’ll let y’all know the minute I get lonely. I have this feeling it may not come. Been ready for this. I think it was in Big Magic by Elizabeth Gilbert. She is talking about the creative process. And she's telling the story of a writer who would get inspired at the most inopportune moments. She'd be outside, working in the garden, and the creative inspiration would roll in like a mighty wind, and she'd have to run inside to catch it all on paper. I don't remember who she was talking about, but I love and hate this story. I think it was also Tom Waits who would get inspired while his hands were on the wheel, and he'd grunt, "Not while I'm driving!" I've been waking up at 2, 3, 4am. For years. I don't want to do anything at this hour. Nuuuuu-thiiiiing. But I'll lie in bed and think about writing, or about a painting that hasn't been born yet. Or let fantastical anxieties dance through my mind. I've gotten up the past two days. Yesterday at 4am. Today at 2:45am. It's 4:14am right now. I wrote yesterday, and developed the idea for a new painting, one that I have asked to patiently wait for its turn. it told me it's not going to wait. I all ready drew this morning, something I started last night. And now I'm writing, which is something I daydream about constantly but never do. There is something deep within me that won't let me rest. Sometimes I believe it's God. Or God's hand on me, the person he made me to be- full of pesky inspiration. Whatever it is, it won't let me rest. There is something it wants from me that I've been neglecting, at my own expense. It's hard to want to go deeper, into pain, or grief, or ideas. I believe it won't let me rest until I've processed it through my hands, to process the beauty, too. You'd think it would be easy to recognize this deep prodding and follow it, but it's not. I'm sleepy right now, and I may be sleepy the rest of the day while at work. And I hate feeling sleepy. I also don't want to - no, I do want, but- it's hard to make this work that I have asked to wait. I don't feel ready for what it's going to take. And I'm fearful of making work that isn't readily available to share and show. It could take years to create. I think this is why I moved my studio home. I knew my brushes needed to be closer to my bed. Getting to them by car at 2am would never work.